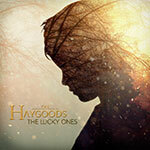 The Haygoods new album has 10 completely new songs written over the course of 2 years! 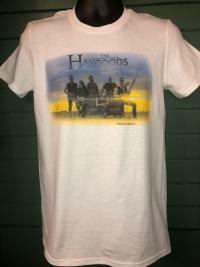 Its a whole new sound for The Haygoods and you will love it! 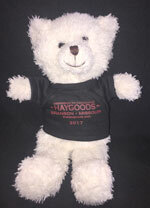 The Haygood show is amazing and ALL NEW!!! Get your copy today!!! Every single show is filmed live so please enter the date you want below. If you just want the most recent copy just leave it blank and we’ll send you the latest show HOT OFF THE DVD BURNER!!!! 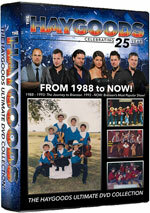 Includes a DVD with the show from any date you choose. Experience this new souvenir autograph book! 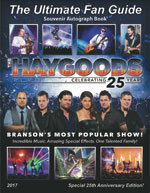 “Adventures of the Haygoods,” is a look into the lives of one of the Midwest’s premiere performing families. From rehearsals to social events to live performances and beyond, this zany series will keep you entertained for hours. Included in the box set is an entire dvd devoted to bloopers, outtakes, and never before seen music videos and archived footage. With over 1.5 million fans and satisfied viewers on national television, this series is sure to be a hit with your family as well!! recorded LIVE! The energy, excitement and spirit of The Haygoods legendary Branson Christmas Show has been captured on this incredible album! THIS IS A LIMITED SEASONAL RELEASE SO PURCHASE NOW BEFORE THEY ARE GONE! While in town make sure to visit our gift shop H & H Goods located in downtown Branson.